February may be a quiet time for fishing in the Pacific Northwest, but the FisherPoets Gathering brings Astoria alive this month with its celebration of the commercial fishing industry in poetry, prose and song. Begun almost two decades ago, the Gathering now brings nearly 100 poets, storytellers, and songwriters and their fans from the east coast to the west, and as far away as Hawaii and Europe, to our Columbia River community. The U.S. Library of Congress recognizes the FisherPoets Gathering as a ‘Local Legacy’ project that has ‘spawned’ the genre fisherpoetry through the voices of those whose careers are linked to the sea as fisherman, shipwrights, and cannery workers. Smithsonian Magazine, the New York Times, Wall Street Journal, the Today Show, and BBC all have featured this unique event. 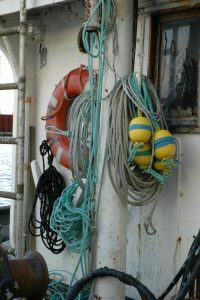 For a taste of the talented fisherpoets’ catch, visit In the Tote an on-line anthology of works by participants in past FisherPoets Gatherings. This year, Fisherpoets will perform poetry, music, and prose Friday and Saturday evenings, February 24 and 25, from 5:00 – 11:00 pm at venues throughout Astoria including the Astoria Event Center, Columbian Theater, KALA performance gallery the Wet Dog Café, the Voodoo Room, and Fort George Brewery’s Lovell Showroom. They’ll offer workshops Saturday morning on topics such as song writing and knot tying at the Columbia Maritime Museum, and gather later on Saturday afternoon to share oral histories at the popular Story Circle. You’ll also find visual art by Fisherpoets displayed at local galleries and screenings at the Columbian Theater Friday and Saturday afternoons. Clementine’s Bed and Breakfast is the perfect location for enjoying all the different Fisherpoet events – you’ll be a short five-six minute stroll from almost all the venues. Don’t wait to give us a call or go online and book your stay – as Sharon Boorstin titled her Smithsonian article (www.smithsonianmag.com), “Rhyme or cut bait: When these fisher poets gather, nobody brags on the verse that got away”! Admission for the weekend: $15 event buttons will be available from all venues and at the FisherPoets Gathering Gearshack beginning at noon on Friday, February 24, 2017. This entry was posted on Friday, January 20th, 2017 at 4:15 pm and is filed under Clementine's Bed & Breakfast News, Events, Festivals. You can follow any responses to this entry through the RSS 2.0 feed. Both comments and pings are currently closed.